Or is this one of those redundant post exploitation "techniques"? If so, why is ASLR/DEP even mentioned? nice trick, you introduced the ability to make primitive api calls from your .net shell... y'know that .net means platform independance, and shellcode is intended to achieve address-space independence. you have a variety of other higher-level and potentially more useful functionality available to you. regardless, it's great that you're learning how to execute other people's shellcode everywhere and all. If you watch Dave Kennedy's Powershell talk that he gave in 2010 you would see that an ideal use case for this would be in a teensy payload. The teensy payload that's built into SET first drops an encoded payload onto the file system. This would eliminate that step and execute the payload entirely within memory. By your wording, yes this would be one "one of those redundant post exploitation techniques." If you don't find the value in it, so be it. That's awesome stuff. May I use this in one of my upcoming preso? And yes the best usage is with Teensy. I have also used your "exe-to-text" blog post in my code. Thanks a lot. By all means. This was all meant for public consumption. Glad you enjoy it. Awesome! Realy usefull in described scenario. Use the same piped commands for the 64 bit as well. Cute, but what exactly is this supposed to demonstrate? You're already at a shell fully capable of executing arbitrary processes under the context of the current user. Trying to hack that through some kind of shell script would be silly, especially since PowerShell will not, by default, execute any scripts that are not trusted. If you've already exploited the system to this extent you don't need PowerShell to carry out any of these tasks. Laugh, its apparent this dude has no idea what he's talking about. The implications are huge on this as far as evasion techniques and previous ways of injecting straight into memory without the need to interface an executable or dropper. What you may not realize in the exploit world is compromising the initial system is half the battle, the payload is what you want afterwards. Please read security books before posting stuff like this. 1) "PowerShell will not, by default, execute any scripts that are not trusted"
Yes it will. It is trivial to bypass the execution policy by including an encoded powershell command within a batch script. As I said in my post, this technique is well documented and you can easily find it on Google. 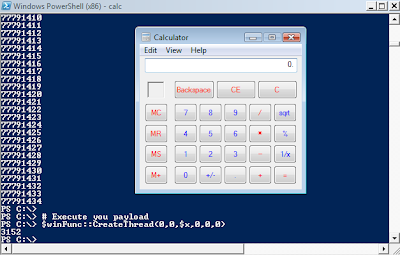 2) "If you've already exploited the system to this extent you don't need PowerShell to carry out any of these tasks." Take the time to read my previous comment. The whole point is that you can use this to execute shellcode that is entirely memory resident. The ideal use case was the teensy payload and the java applet payload in SET. In fact, Dave Kennedy has already indicated that he is implementing this technique into the next version of SET. Additionally, from my testing, launching a payload such as a meterpreter callback using this method doesn't flag AV or HIPS. As in my previous comment, if you don't find the use in this, so be it. By all means, develop something that's useful for the community. As was mentioned in my first blog post, the whole point of my blog is primarily for my own self-edification. If other people benefit from it, great. If not, I wouldn't waste your time. 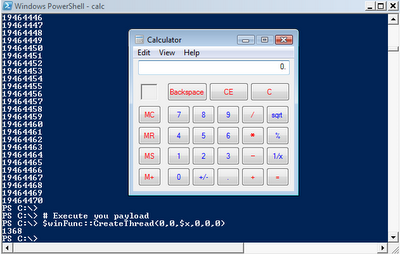 In fact, I posted an almost identical script to use with PowerShell Remoting some time ago. So, in case you have pwned a user in a domain that is not local admin but has the privilege to "remote" to another host with PowerShell, you can use it to drop your shellcode on the second host. Damn. That's cool. And here I thought that was actually contributing something original. heh ;D Could you provide a link for comparison? Yeah. Using this to execute code remotely on machines w/ PS remoting enabled was definitely a good use for this that occurred to me. Congratulations, as it looks like SET 2.2 was released with your powershell attack vector included! you labeled this "exploit", so I am wondering where the exploit is. I cannot see privilege escalation, and hiding code or executing it in-memory is something that PS can do by default. There may be use cases but as far as I can see right now, I cannot identify security implications. "An exploit (from the verb to exploit, in the meaning of using something to one’s own advantage) is a piece of software, a chunk of data, or sequence of commands that takes advantage of a bug, glitch or vulnerability in order to cause unintended or unanticipated behavior to occur on computer software, hardware, or something electronic (usually computerised). " I would say that this was an unintended side effect of powershell and the ability to leverage direct code execution without a direct buffer overflow or memory-based exploit and not drop a PE file onto disk where it can be detect. What's up with the trolls here that don't know squat about security? I'm wondering where the exploit is as well. I was careful not to outright call this an exploit because it's not. If you're referring to "Powershell Code Execution 'Exploit'" in the code, note that exploit is in quotes. The use cases are certainly there. Please refer to the previous comments for those. As for the security implications, this already assumes that you compromised a machine with Powershell on it. As I've stated previously, if you don't find the use in this, so be it. Can't get it working if I do a get-content -encoding byte from a file containing the shell code...my powershell just crashes..could you please have a look? I assume you have your shellcode in a text file in the form 0xXX,0xXX,0xXX. Right? That's it. Now it's in the byte array form that's needed for it to execute. No need for me to look at anything. Hope that helps. That worked like a charm, so silly of me. Thanks a lot!! After watching the results of the above commands, you'll notice how the OS will try to parse test.txt as an executable. And watch your notepad popping up. The above won't work with calc.exe, don't ask me why, but it seems the calc.exe is checking the extension in the filename (curious). Now, knowing that most AVs won't check .txt files, imagine the implications. For those who think the bottleneck will be writing your payload to disk, I' ll tell you that the echo command is capable of doing so, just type "echo [ALT+10]>test.txt" without quotes and pressing ALT+NUMPAD 1+NUMPAD 0 where the string "[ALT.." is. Then open the file and see what's inside. It will work with any other character and I m almost sure this can be achieved programmatically and remotely, a way or the other. I'm aware of the technique for manually entering arbitrary characters via echo. I however, have been unable to find a way of performing that process programmitically without using debug.exe, vbscript, or powershell. If you come up with a way, please share. Thanks. I love this. Using powershell to build C# with P/Invoke's is just cool. I've started playing around with the compiler API's for a project at work. I was thinking that something like this would be possible and awesome...awessible? The tards that keep saying "will this getz me r00tz?" really lack imagination. Even if this was running as an unprivileged user there is a lot of information that could be gathered using combinations of .net and win32. And like you mentioned it would, by and large, be invisible to host security software. Why is dwSize the third parameter to VirtualAlloc when in the win32 API it is the second parameter? Sorry. I'm not seeing where dwSize is being used as the 3rd parameter. Ah. Yep. Good find. Thanks for pointing that out. Thanks for posting the code! It works beautifully and AV doesn't say a word about it! Awesomeness.